I have always believed that it takes a ‘special’ kind of heart to be a kindergarten teacher – sugar maybe? As an upper elementary educator, I often take for granted that children come to me already knowing how to hold a pencil or writing words with spaces between them. This week, I had the rare opportunity to visit a kindergarten classroom at my school and I was fascinated with what I saw…I just had to share the wonders that take place inside a dual-language classroom – especially kinder. 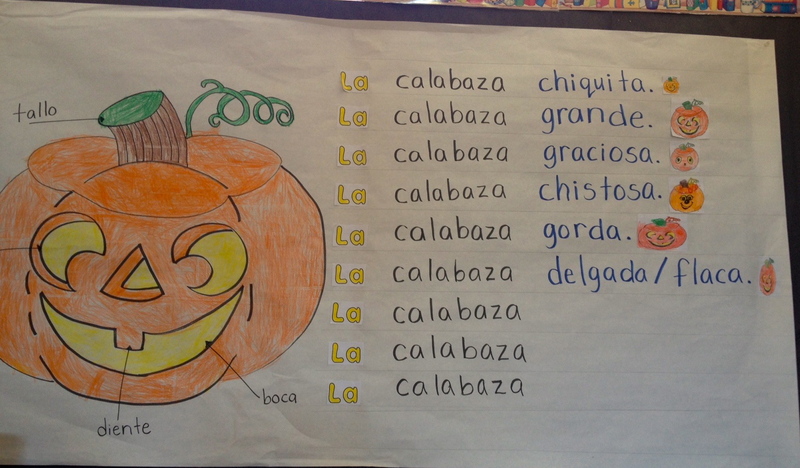 First, and contrary to what several people I have met thought, many students at dual-language schools do not come from houses where the target language is spoken. In fact many kinder students come from English-Only households (or EO’s). So imagine this: A child comes to a classroom where his/her language is NOT spoken (in a 90/10 program which is more 100/0 at the beginning of the year). 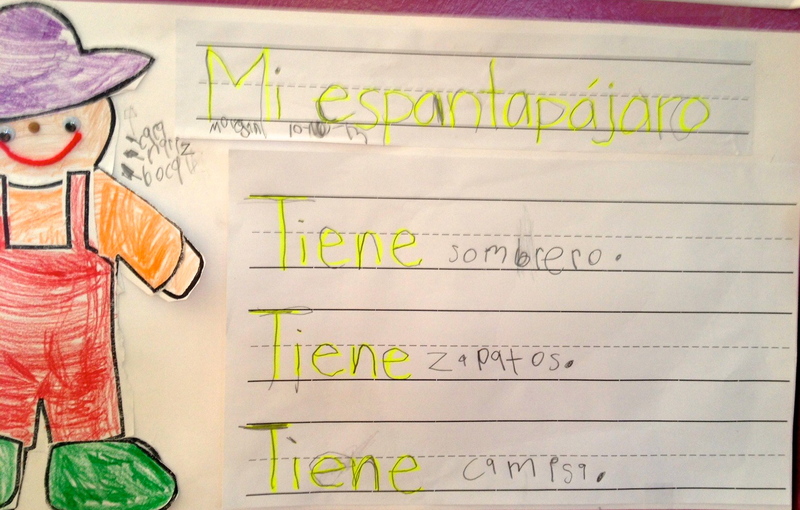 This student is spoken in the target language all the time from numbers, letters, to directions. Therefore I wondered: How do they do it (teachers)? How do children survive? I can only think of myself being thrown in a foreign country. What would I do? 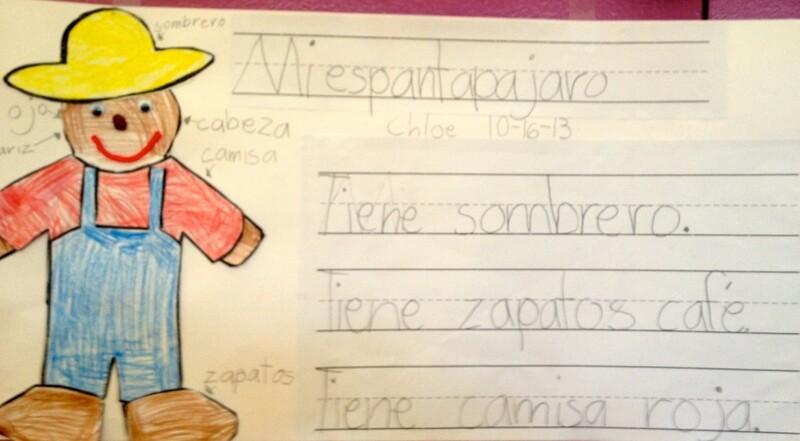 It is here that the wonders of a well-designed dual language classroom start to work. Children survive…they just do. They learn fairly rapid commands and key words. It starts slow, but in a few weeks they take off (even their writing). 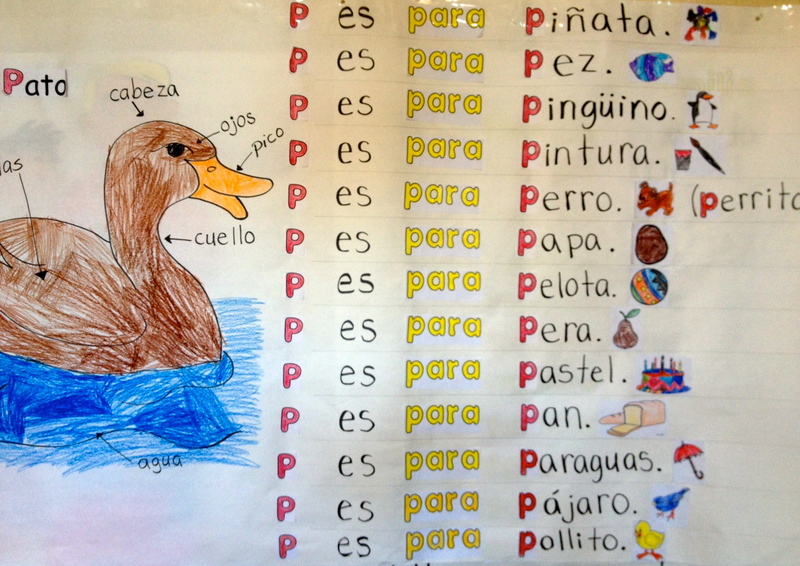 When I visited the classroom, what caught my attention were the amazing charts: plenty of charts with rich vocabulary and eye-catching illustrations. 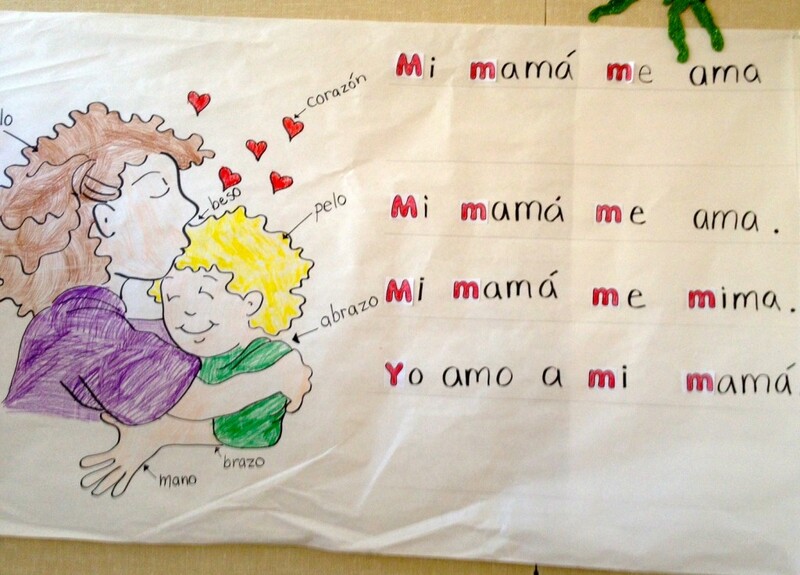 In fact, these charts become a crucial part in a child’s journey through kinder. EO’s rely on them especially for writing. The kindergarten teacher mentioned how children not only look for them but also request them. The charts below are a small sample of what I was able to capture (I wish I were more artistic!). So my question to you SpanglishBaby moms, dads, and other family members is: How many visuals are there at your home that support your child’s language acquisition? Is there a visual schedule, an area where you cut/paste/draw illustrations? I would love to read and see what amazing things you do at home. Wow! I love it! I really should have put my kids into a spanish speaking school. But its not to late. I want to push my kids to learn my cultural language. Since they are Guatemalan and African American there has not been a constant push through out the entire family to speak only spanish. I will make the attempt to have spanish spoken at least 50% of the time. We really miss you Kelly. Glad to see you doing well in your new school. No doubt you will make a great difference there. So glad to hear from you. Thank you for stopping by and leaving a comment. I miss you all very much. Also, I am happy to see that you are taking a step forward and trying to find ways to bring your culture into their lives. Elijah and his younger brother will for sure pick it up quickly. MIL, MIL, MIL Gracias!!!! My children are in an immersion program (1st and K grades) and I often feel lost and wonder “what/how are they being tought”. Spanish, French and English are the core languages followed by Hebrew and Arabic at home. (Yes. People think I am crazy.) Since my children started school, I find myself ‘searching’ for dual immerson/bilingual resources and find it hard to find material. To answer your question, our children draw A LOT, but we don’t have many visuals – for the reason listed above. 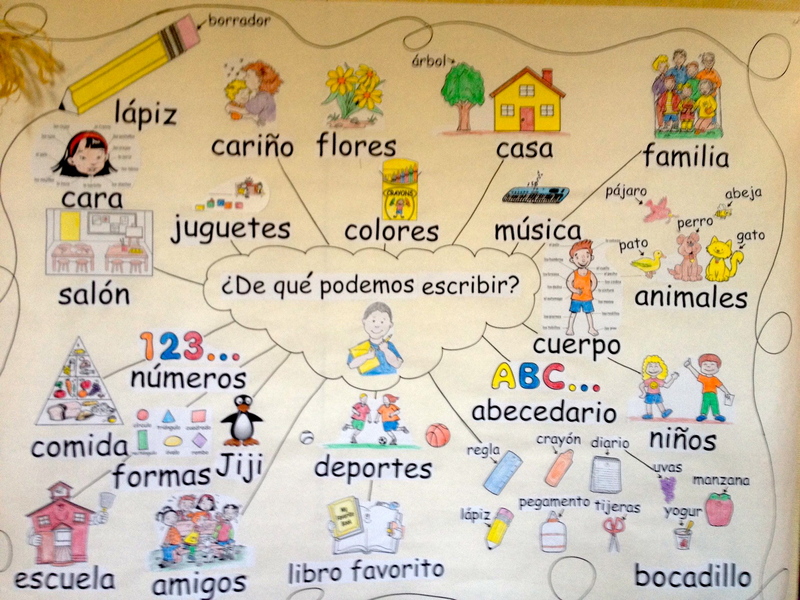 I actually created a visual bilingual schedule for the AM/PM routine, but it has taken me some time to do and complete – finding the correct immages, etc…. Trying to figure out what to do/incorporate with what they are doing at school is also a challange 0 seem as though I am playing catch-up. Wish I could create more but lack of time and resources are the struggle. Any suggestions where I could be looking? Any suggestions to help them learn to read Spanish? At our school, I wish the program incorporated a bilingual alphabet that used the same sight word to recognize the letter, like B – Balon/Ball, E – Elefante/Elephant, S – Serpiente/Snake, etc… It would help the children SO much!!! Anyway, loved your post! And, I am happy to have found your blog. I will be sharing both with parents, teachers and administrators at our school. Te deseo muchisimo exito! Thank you for your comment/feedback. I am glad you found the post helpful and informative. Also, oh my! 4 languages! You have to share with all of us the secret to doing it and how to handle it as well. I have always believed that children can learn fairly quickly. In Europe it is not unusual for people to speak 3, 4 or 5 languages. Why can’t we do that here in the U.S.? Again, thank you for your kind comments and for spreading the word about my blog/posts here on Spanglishbaby. It really-REALLY means a lot. Hello, that post was very interesting. In England we don’t seem to have dual language schools so home input is very important. I stuck some jungle stickers to my daughters wall (her room is jungle themed) and painted above and below the animals in both English and Spanish their names to help her learn when she gets older. I also take her to ‘sing and sign’ lessons. Although these are held in English using British sign language, I use the same signs when I speak Spanish to her. 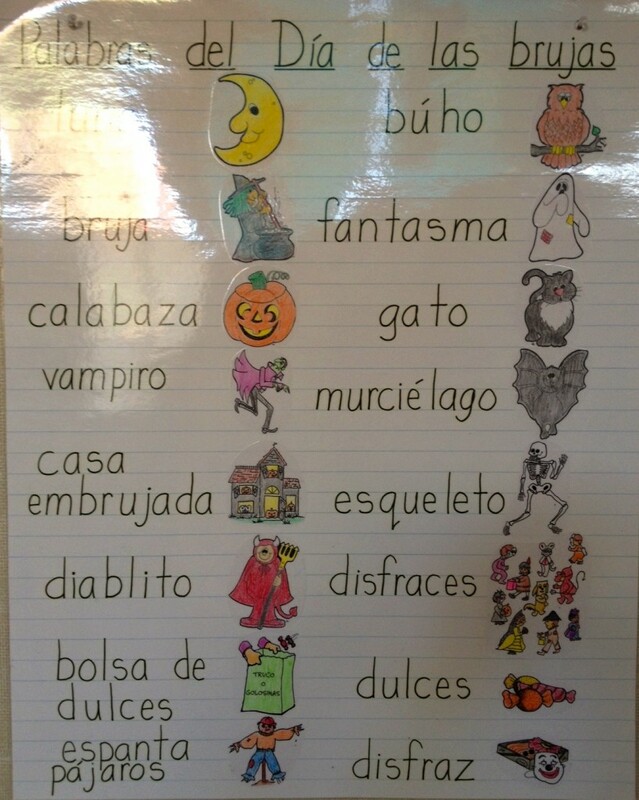 I’ve noticed it really helping to reinforce concepts she has learnt in English first when I say them in Spanish. The key to sing and sign really is to only sign a few key words in the sentence not every word. You can even make up your own signs for things, you don’t have to use set ones. It’s aimed at children under 2 or 3 years old but I recommend anyone raising a bilingual child do it as it really does support the idea that those two words both mean the same thing. After reading this article I will definitely be using more pictures to help in my quest of raising a bilingual child. I LOVED reading your comment and the info you shared about sign language. Sign language is in my bucket list for sure. I am happy to see that you will be using more visuals with your child…they can only help. I am happy to see the post has given you some ideas for your daycare and your child’s playroom. Ans YES! This will for sure help them – One important thing though, make sure you are referring to the charts often, otherwise the become nice ‘wall art’ but have little or no impact on you kiddos. If you use them/refer to them, your kids will do the same. Hi there. Today the use of bing. This is a really beautifully published report. We’re likely to take note of them are available returning to discover more of this techniques. Many thanks for the particular write-up. I most certainly will definitely return. Good ?I should definitely pronounce, impressed with your website. I had no trouble navigating through all tabs as well as related info ended up being truly easy to do to access. I recently found what I hoped for before you know it at all. Quite unusual. Is likely to appreciate it for those who add forums or something, website theme . a tones way for your client to communicate. Excellent task. Hello, constantly i used to check blog posts here early in the break of day, for the reason that i love to gain knowledge of more and more. best blogging platform available right now. (from what I’ve read) Is that what you are using on your blog? Non ha alcun effetto sulla grossezza del pene. Hello, i think thzt i saw you visited my site thus i came to “return the favor”.I’m attempting tto find things to improve my web site!I suppise its ok to uuse some of your ideas!! the bounty hunter to hunt down the evil scientist Dr.
the developer for such a creative and impressive science-fiction themed game. That’s what happened with GM – they went to the market with an attitude of “good enough. can find a domain that has a frequently-searched keyword relevant to your business, that is also available. representative of the agency understands your requirements for the venue. as there’ll be many constructive adjustments when you lose weight. appeared as if, in addition it affects life’s sum total quality, the way in which you think about health and fitness, pressure, health problems and oneself. - and I could prove it! not. We decided to pitch our tents at the nearest campsite, so we could enjoy the views for another day. they may relate to these very different types of gardening. The Movies is a huge game and on top of the tycoon management you can also write and direct your own films. on exploring rather than repetitive chores on the farm. and then you can make Wow gold for your character. enjoy the results. This workout packs a 45-minute INSANITY workout into 20 crazy minutes. It is popular worldwide due to its attractive nature. any type of furniture and make your home beautiful and attractive. Take into account that it just takes two $200 inside the money trades a day nets you $300 in profit each day. binary option is based upon and therefore trades take place in real time. This is always of great benefit and a huge win when playing in the emulation game. Good post.. abaya I was checking out regularly this blog for fascinated! Extremely helpful details specially the previous part My partner and i deal with such information considerably. I used to be searching for this particular info for just a number of years. Appreciate it as well as of success. Great post! We will be linking to this great article on our website. to this jewelry piece and enhances the importance of the piece in the eyes of the wearer and the viewer. present cause customer connection associate. the most effective Web service. a UFO series ‘ producing no less than 6 games and 3 more late ‘spiritual’ sequels. Sound effects are a little underwhelming but this hasn’t been a problem for me. Before allowing any “M” rated games in your home, decide how old children can be before they play them. Great remarkable things here. I am very satisfied to peer your article. Thanks a lot and i’m having a look forward to touch you. Will you kindly drop me a e-mail?